Authorised distributor of world-leading brands in telecommunications & Information Technology. The year 2015 witnessed the addition of another feather in the cap of Bin Hindi Group, when they launched their first foray into multi-brand electronics retail and distribution. The division commenced business with the introduction of the European smartphone Yota Phone in the Bahrain Market. The first “always on” smartphone, with two full android functionality screens. With features like hands free messaging and email and a reading time of 100 hours, that is stress free for the eyes due to the glare-less e-ink screen, which is the best option for reading in sunlight. This was followed by PanzerGlass, the best tempered-glass screen protectors from Denmark. The best screen protectors among the competition and also a TÜV Test Winner. This is the benchmark for the toughness and strength of the screen protector glass. 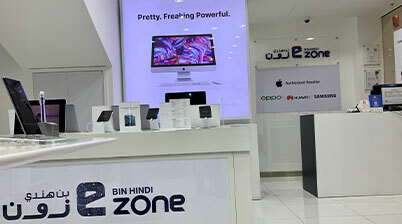 When the world’s leading brand of IT & Telecom, Apple Inc. and the Bahrain’s leading name in retail & trading of IT & Telecom joined hands, it gave rise to a name –The Bin Hindi eZone. Apple’s brand equity in product quality and innovation is brought to the people of Bahrain through the reliable & trusted name of Bin Hindi eZone. Diversification has become the cornerstone of developing economies across the globe and this principle is manifested in the various divisions that the group has set up over the years. Bin Hindi Group had set pioneering divisions to enhance partnerships with International brands. Introducing Bin Hindi eZone comes along with this diversified strategy pursued by Bin Hindi Group Management. PanzerGlass: The toughest Tempered Glass screen protectors for smartphones and tablets from Denmark. This definitely is a perfect combination to give the customers peace of mind and confidence to buy the latest and the best IT & Telecom product range that the market has to offer. To facilitate the purchase of the products,Bin Hindi eZone has opened its first retail store in the heart of the Manama business district at Gosi Mall. With the passage of time, more retail stores shall be opened to cater to the needs of the people of Bahrain at upcoming and popular business destinations.